08.17.09 = SKYLINE CHILI!!! To follow yesterdays post, my topic this week is local food. 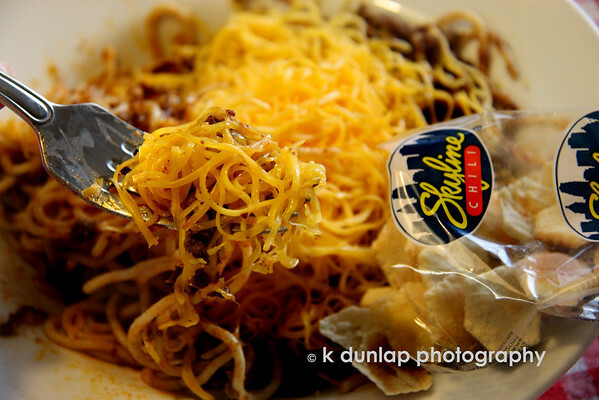 Even if you have never been to Cincinnati, you may have heard of "Cincinnati Style Chili". We like our chili a little bit different here; over speghetti. A 3-way is spaghetti topped with chili and cheese; 4-ways, the same with your choice of beans or onions added and a 5-way, both beans and onions added. The chili is not a tomato base or a Texas style chili it has a touch of cinnamon and some say, chocolate in it. The secret family recipe is kept in a safe! My favorite are the cheese coneys; little hot dogs with chili, mustard, onions topped with a mountain of cheese. Oh, and dont forget the oyster crackers on the side! Skyline chili, a hometown favorite! Now I have yet another thing to look foward to on my next trip to the US, Kris, if only I can make it over to your part of that big country! The photo makes the food look so inviting. Very well done, then. The Wikipedia article is most interesting, too. Kris, I loved the picture so much- I just had to make my own version of 5-way chili for dinner! The family was not completely sold (I don't know the secret ingredient, of course), but they've never had the REAL stuff! Thanks so much for the inspiration! This reminds me so much of being a kid, growing up on the west side of Cincy. If I remember correctly, Skyline chili was pretty cheap too! Really yummy stuff! Makes me miss it. Oh, sorry, this is a really mouth-watering image- well shot- love the detail in the cheese. That sounds so good..making me hungry!! Fantastic shot. Low cholesterol diet...give me the 5-way for sure. Yum! I'd like to try this! Nice shot ! This something I'd really like to taste !